What causes the brown water at Muizenberg beach? Capetonians are familiar with the tea-coloured water that runs in our mountain streams. Most people know that the brown colour comes from tannins, leached naturally from the indigenous fynbos vegetation. 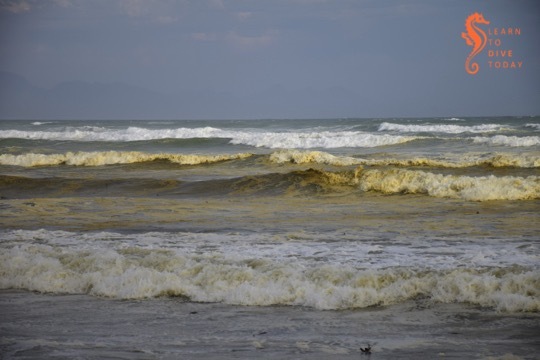 Perhaps less well known is the reason for the brown water that is sometimes seen in the surf zone along Muizenberg beach, stretching all the way to Strandfontein, Monwabisi and beyond. The most frequent explanations that are offered on social media are, of course, pollution, “raw sewage”, and the like. This is not the reason for the brown water, and it does not necessarily impact the water’s safety or healthfulness for humans to swim in. 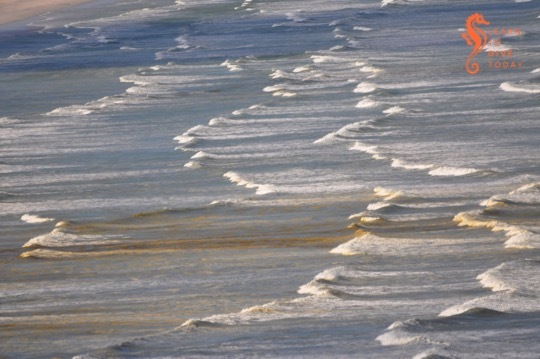 Like False Bay’s famous colour fronts, the reason for the brown waves at Muizenberg beach turns out to have much to do with the topography of False Bay, particularly of the kilometres-long beach at its head (Muizenberg-Strandfontein-Macassar-Monwabisi), and something called a diatom. Diatoms are a type of phytoplankton (plant plankton or microalgae). 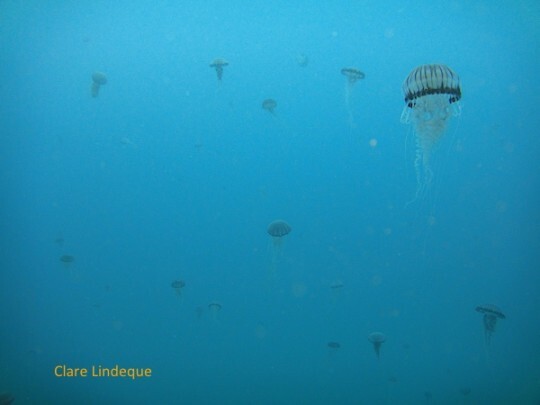 They are single celled, usually symmetrically shaped organisms that multiply by dividing in half at a constant rate. Their cell walls are made of silica, SiO2. Chicken keepers and gardeners may be familiar with diatomaceous earth – this is made up of the fossilised shells of ancient diatoms. Diatoms are what are called primary producers or autotrophs, meaning that they generate organic material from carbon dioxide and other inorganic nutrients (for example nitrates and phosphates), through the process of photosynthesis, which uses light as an energy source. 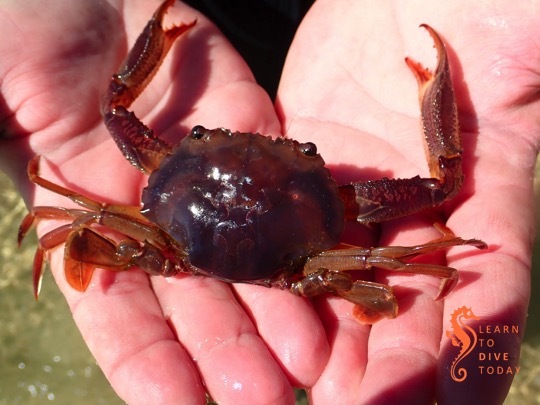 Primary producers sit at the base of the food chain and all life relies on them, directly or indirectly. Everything else produces organic material from other organic material (such as diatoms). I am telling you all about diatoms because the brown water at Muizenberg contains an accumulation of a diatom that you can call Anaulus australis Drebes et Schultz the first time you mention it, but usually just Anaulus australis, or Anaulus for short. There are several members of the genus Anaulus, but usually just one tends to be dominant at each beach where these accumulations occur, and Anaulus australis is the main species found along the South African coast. Analaus are pillow-shaped diatoms. If you wanted to see what an individual Anaulus diatom looked like, you’d use a microscope, but when enough of them are in one place, they can be seen to change the colour of the water. There’s a picture of them under a microscope at the bottom of this webpage (they also occur in Brazil). 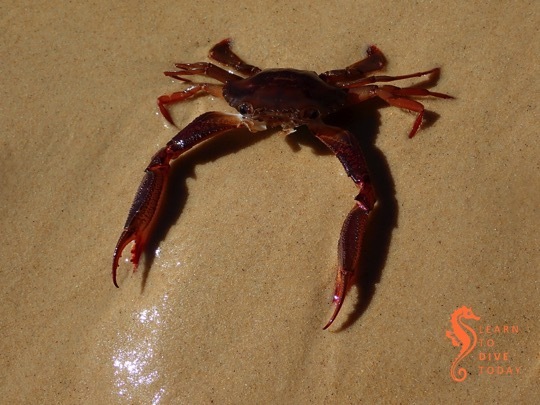 They occur at beaches with particular topograhical characteristics, which explains why you haven’t seen them at Camps Bay, Kogel Bay, or Scarborough. At hospitable beaches, the diatoms are always there, spending much of the time lying dormant in the sand behind the surf zone. A proportion of the diatom population is able to survive for relatively long periods (estimated to be more than two months) like this, in the dark on the seabed, not photosynthesising or dividing, until the correct meteorological conditions arise for an accumulation. But first – what sorts of beaches are hospitable to Anaulus? The head of False Bay where Muizenberg is situated is incredibly nutrient-rich, much of it thanks to urbanisation. 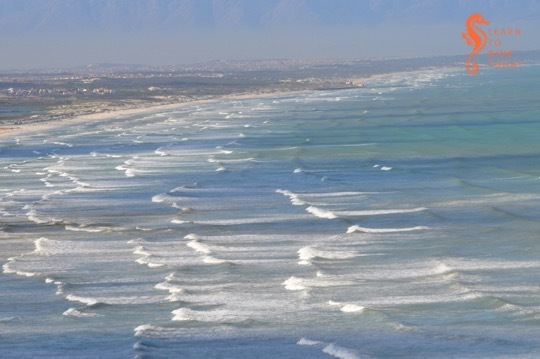 The canalised Zandvlei estuary – the only vaguely functional one on False Bay’s coast – is situated a short distance down the beach, and supplies nitrates, phosphates and other nutrients to the surf zone. Many of these nutrients are technically pollutants, added to the river further upstream. The Cape Flats Waste Water Treatment plant at Strandfontein also discharges 200 million litres of treated water per day (under normal, non-drought circumstances) via a canal onto Strandfontein beach. This is essentially an artificial estuary for Zeekoevlei. This waste water has spent some time working its way through the settlement ponds at Strandfontein, but is nevertheless rich in ammonia and other nutrients, and Anaulus accumulations are a very common sight in the surf around this discharge point. The dunes that run along Baden Powell drive overlay a high water table, and groundwater seepage – specially during times of heavy rainfall – may also leach nutrients out of the ground and into the surf zone. The meteorological conditions required for an Anaulus accumulation involve strong wind and a large swell. These act together to create rough sea conditions, which stir up the dormant diatoms from the ocean floor. The diatoms adhere to air bubbles in the surf zone, staying suspended in the water column, which is when you would notice the water turning brown. Exposed to light, they awaken from their dormant state and start to photosynthesise, take up nutrients, divide and multiply. 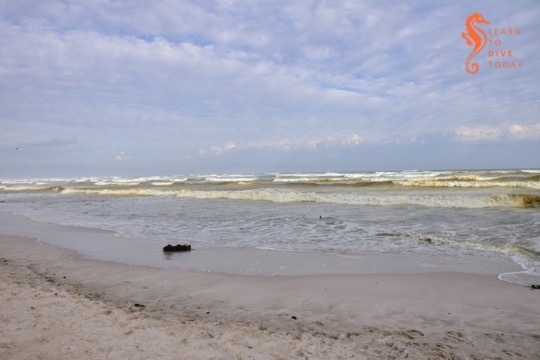 The presence of rip currents creates an onshore-offshore flow all along the beach. This forms a semi-closed ecosystem, and the diatoms are essentially trapped in gyres in the waves. Longshore currents that run parallel to the beach transport Anaulus cells out of the surf zone at one end, and bring fresh (sea)water in at the other end of the beach. You’ll notice that, contrary to what you may have seen when large amounts of plankton are under discussion, I’ve been using the word “accumulation” instead of “bloom” to talk about Anaulus. This is deliberate, because of the constant presence and constant rate of division of the diatoms. When the water goes brown, it doesn’t mean that Anaulus is suddenly multiplying faster than usual. It means that it’s all been gathered together in patches, is exposed to light and therefore photosynthesising (at its usual steady rate), and is thus more visible than it was when it was lying on the ocean floor. You may also be thinking that everything I’ve said about the nutrients that Anaulus requires to survive and thrive points to the fact that humans – and pollution – are ultimately responsible for these brown-water plankton accumulations at Muizenberg. Well yes, in a way. 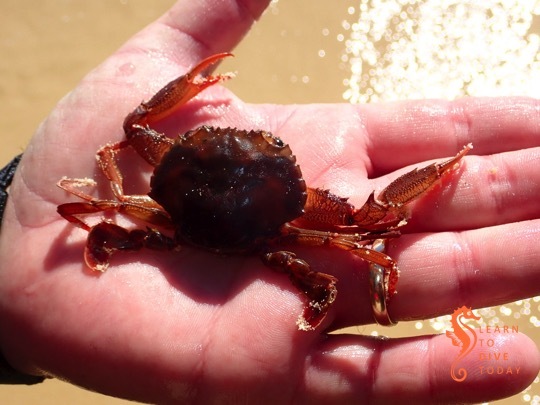 But accumulations of Anaulus australis and related species have been observed and documented for well over 100 years at suitable beaches around the world, and are a natural phenomenon. Yes, we are providing more nutrients to the False Bay diatom population than they would otherwise have received without human settlement in the greater Cape Town area, but these accumulations would likely occur regardless. 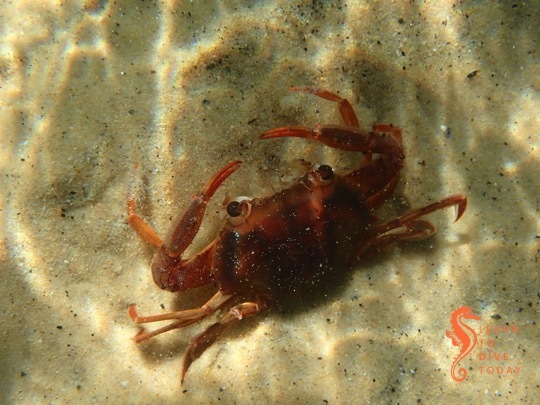 They are certainly more intense now than they would have been in the past, but estuaries are nutrient-rich locations even when not surrounded by a large city. Furthermore, the water table is high on the Cape Flats, which would supply nutrients to the surf zone regardless of whether humans lived nearby. Anaulus is in fact performing a vital and useful function by mopping up the excess nutrients that the city discharges in the ocean. The mass of diatoms – primary producers – also provides a food source to bivalves such as mussels, and other invertebrates. We can be grateful that the excess nutrients that urbanisation directs towards the ocean at the head of False Bay leads only to accumulations of harmless diatoms, rather than to frequent occurrences of harmful algal blooms that can kill marine life and exacerbate respiratory problems in humans. Most of the original scientific study on surf zone diatoms in South Africa was done by a group of researchers (primarily M Talbot, Eileen Campbell and Guy Bate) from the University of Port Elizabeth, working at the Sundays River Beach in the Eastern Cape. I did quite a bit of reading to research this post, but you can start with this paper for a description of the topographical characteristics of beaches where surf zone diatoms accumulate. The first few chapters of this Masters thesis also provide a good overall survey of what is known about surf zone diatoms. The number of beaches worldwide where surf zone diatom accumulations occur is so small – less than 100 – that Odebrecht et al could enumerate them in a 2013 paper. 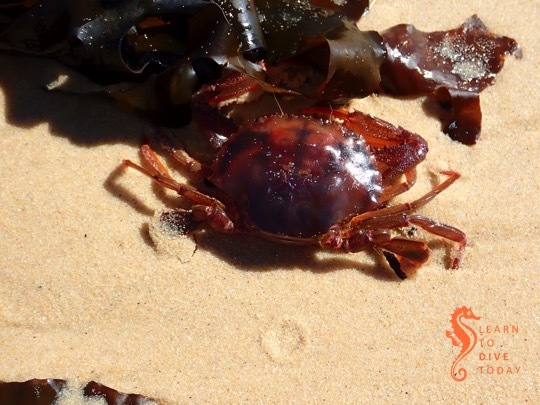 I hope this helps to convince you that the brown water at Muizenberg beach (and beyond) is something special and interesting, not to be feared. Go surfing! Posted on 31 January 2018 7 June 2018 Author ClareCategories Algae, Beach, Canals, Current, Dunes, Estuaries, Rivers, Surfing, Swell, Swimming, Waves, WindTags science, science communication4 Comments on What causes the brown water at Muizenberg beach? Compliments of the season. If you’re contemplating which beach to head to for tomorrow’s traditional Boxing Day beach outing, a venerable South African institution, I have just the book for you. The product of a mammoth investment of time (which couldn’t have been all bad) and distance travelled, Life’s a Beach is a handy guide to (possibly, probably, almost) every single beach along South Africa’s coastline. Each pair of facing pages covers a stretch of coast, and beaches are rated for surfing, alongside information about swimming, kiteboarding, wake boarding, kayaking and canoeing, diving, fishing and hiking. 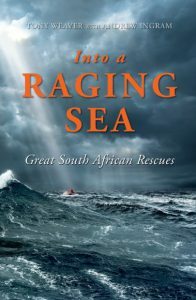 The scuba diving information for the sites around the Cape Peninsula, with which I am familiar, is reasonable, but of necessity very abbreviated owing to the book’s format and primary focus. It goes without saying that you should seek out some local knowledge before diving in an area you haven’t visited before. 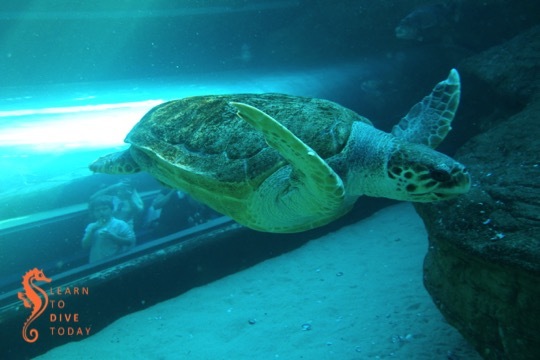 Unique experiences and best kept secrets (no longer – haha!) are highlighted, as well as the presence of braai and picnic facilities. Tips on where to go for sundowners are also included. Child friendly activities are mentioned where applicable, too. Access tips, as well as warnings about rips, pollution, sharks (thank you Shark Spotters!) and whether a beach has Blue Flag status round off the comprehensive information that is provided in a handily concise manner. 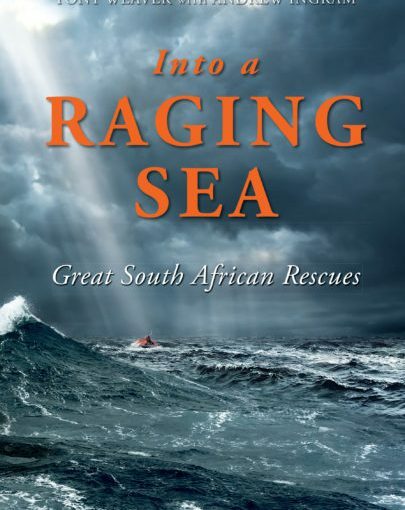 This book will be extremely useful when you’re visiting an unfamiliar stretch of South Africa’s coastline, and particularly invaluable when it’s a little known and less popular beach. Get a copy of the book here, or here if you’re outside South Africa. And if you’re going to the beach in Cape Town tomorrow, make sure you’ve downloaded the free Shark Spotters smartphone app. Get it here for your iPhone, and here for Android. 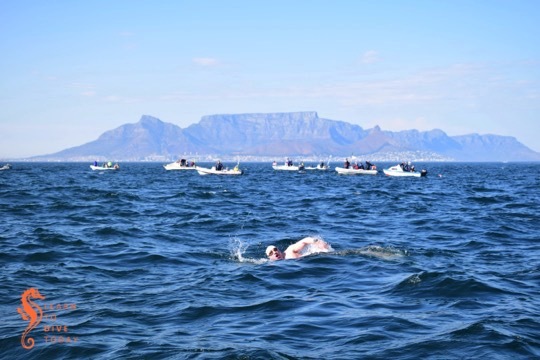 Last weekend we did some boating in Table Bay as a support boat for the Robben Island to Big Bay Freedom Swim. 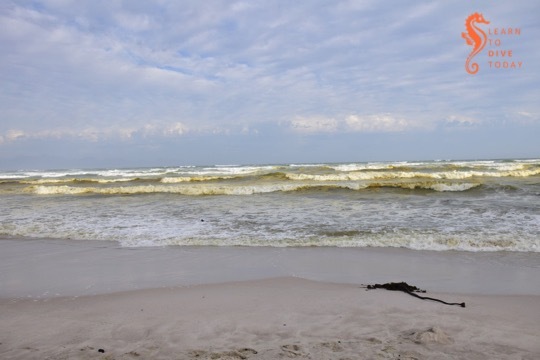 The remnants of the swell on Thursday and Friday was enough to give the swimmers a sizeable challenge with strong currents, choppy surface conditions and very cold patches of water. The swell climbed from under 2 metres to a little over 5 metres this morning. This means diving tomorrow is pretty much out, as is diving on Saturday (thanks also to the Two Oceans Marathon). The swell drops off during the day on Saturday so both Sunday and Monday should deliver some reasonable diving conditions. It is difficult to say whether Hout Bay or False Bay would be better on Sunday and Monday, but I will make that decision late on Saturday afternoon. I have Open Water and Advanced Open Water students so one day is likely to include a deep dive to more than 18 metres. 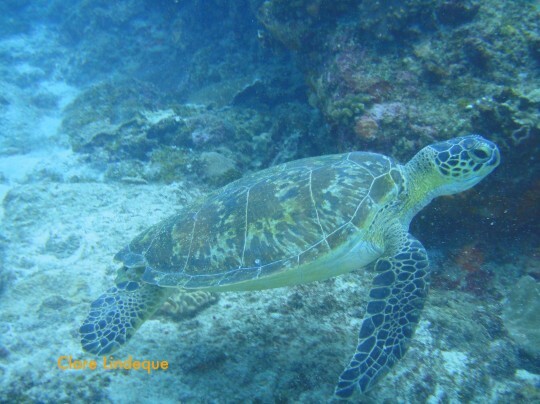 If you are keen to dive on Sunday or Monday, let me know and I’ll schedule you in! Perhaps you have wondered what causes the patterns of strange coloured water in False Bay during the summer months. Perhaps you have dived in it, and wondered why sometimes you can’t see your hand in front of your face! Wonder no more – I am here to help. Frequent visitors to and residents of the shores of False Bay will observe that at certain times of the year, the ocean is marked by bands and arcs of sharply contrasting coloured water. This phenomenon is known as a colour front. In oceanography, a front is the interface or boundary between two separate masses of water. In this case, the water masses are easy to discern, because they are of different colours. There are usually other characteristics of the water on each side of the front that differ, too. Fronts are either convergent (the water masses are moving towards each other) or divergent. 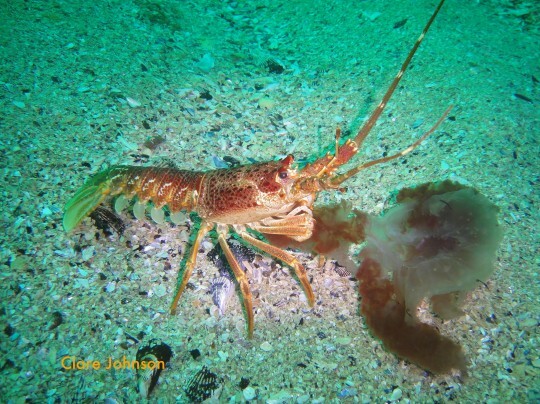 The presence of marine debris (like pieces of kelp) at the front boundary suggests that it is convergent. Prior to 2005, there was much conjecture about the causes of these fronts (including the usual pollution bugbear), but little evidence to support any of the theories. By sampling, the fronts were found not to be caused by pollution, or by plankton blooms in the surf zone. It was known that a colour front was most likely to occur in False Bay after a period of southerly or south easterly wind lasting a few days. October and November seem to be prime months for the phenomenon. When a large, obvious colour front arose near Simon’s Town in November 2005 with milky green water on one side, and darker blue-green water on the other, researchers from UCT and IMT sprang into action, sampling the water on each side of the boundary so that they could measure its characteristics. Speed is of the essence in these situations; colour fronts can disappear quickly. The one in the picture below is busy decaying – notice the smudged boundary. The researchers found that the milky coloured greenish water was full of fine, almost neutrally buoyant particles of calcium-rich sediment. The green-blue water contained much less calcium, but relatively more silicon, which would suggest the presence of diatoms (a kind of phytoplankton – you can think of them as teeny tiny plant-like organisms) or sand in the water. The origins of the calcium-enriched sediment in the milky water are interesting: one source is from the shallows (less than 30 metres deep) of north western corner of False Bay, where the ocean floor is made up of rocks that are rich in calcium carbonate (such calcrete and limestone), some areas covered by a thin layer of sand. The second probable origin for the particles of calcium-rich material is the interface between the sea and the land at the northern end of False Bay. The cliffs at Wolfgat/Swartklip at the head of the bay are made of calcrete, and at Swartklip the beach narrows to the extent that the cliffs erode directly into the water when the sea is high. Strong southerly winds create a wide (of the order of one kilometre) surf zone at Muizenberg and Strandfontein; a spring tide also adds to ideal conditions for the generation of a colour front. The temperature of the milky water was found to be slightly (0.4 degrees Celcius) higher than the green-blue water. This measurement will also vary from front to front. The researchers speculate that the temperature difference could be because the milky water originated in the surf zone, which is shallower and therefore warmer, or because the high concentration of suspended particles in the milky water caused greater absorption of heat from the sun. Here’s the tl;dr: strong southerly and/or south easterly winds, perhaps coupled with spring tide conditions, set up a very wide surf zone along the northern end of False Bay, which disturbs the sediment on the ocean bottom and drives the waves further up the beach than usual. Particles of buoyant calcium carbonate from the sea floor and eroded from the cliffs at Swartklip are lifted up into the water column, changing its colour to a milky-green shade. Wind-driven circulation patterns in the bay push the front from its original location in a southerly direction, towards Simon’s Town. Contrary to what your friends on social media may claim, not all colour changes in the ocean around Cape Town can be attributed to a giant sewerage plume. Hardly any of them can, in fact. 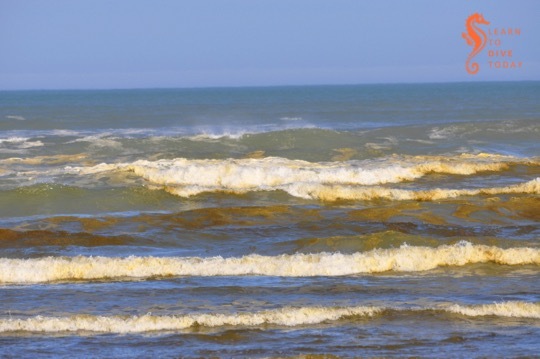 In summer, the reason for the ocean looking green, red or even brown is likely to do with a plankton bloom of some description, or related to suspended sediments (as in this case) or other naturally arising material in the water. Instead of using this as an opportunity to become hysterical on the internet, how about celebrating the incredibly dynamic system that we can observe, living near the ocean? Drive up a mountain next to the ocean and take in the spectacle from on high. Dip your face in the water and see what it does to the viz. Take some pictures for posterity. And – if you don’t know what’s causing it – try to find and question someone who does know, like a scientist, or consult a good non-fiction book, to find out some facts. If you’d like to read more about colour fronts in False Bay, take a look at this scientific paper (pdf), which I used as source material for most of this post. The paper is called A Prominent Colour Front in False Bay: Cross-frontal structure, composition and origin. Scientists have discovered giant eddies, 100 kilometres across, making their leisurely way across the world’s oceans. The rotational effect extends up to a kilometre below the ocean’s surface. They are quite beautiful when visualised (if you were in one you probably wouldn’t notice – they move very slowly). Wired.com covered this discovery in an article last year. Read the Wired article here. Bear in mind that the colours in the maps represent height of the ocean surface, not temperature! If ocean circulation interests you, I cannot recommend Flotsametrics highly enough. You should also check out NASA’s Perpetual Ocean, and their global sea surface temperature and currents map. The Gulf Stream is also quite informative.